Mutations of an alternative splice donor site located within the gag region has previously been shown to broaden the pathogenic potential of the T-lymphomagenic gammaretrovirus Moloney murine leukemia virus, while the equivalent mutations in the erythroleukemia inducing Friend murine leukemia virus seem to have no influence on the disease-inducing potential of this virus. In the present study we investigate the splice pattern as well as the possible effects of mutating the alternative splice sites on the oncogenic properties of the B-lymphomagenic Akv murine leukemia virus. By exon-trapping procedures we have identified a novel gammaretroviral exon, resulting from usage of alternative splice acceptor (SA') and splice donor (SD') sites located in the capsid region of gag of the B-cell lymphomagenic Akv murine leukemia virus. To analyze possible effects in vivo of this novel exon, three different alternative splice site mutant viruses, mutated in either the SA', in the SD', or in both sites, respectively, were constructed and injected into newborn inbred NMRI mice. 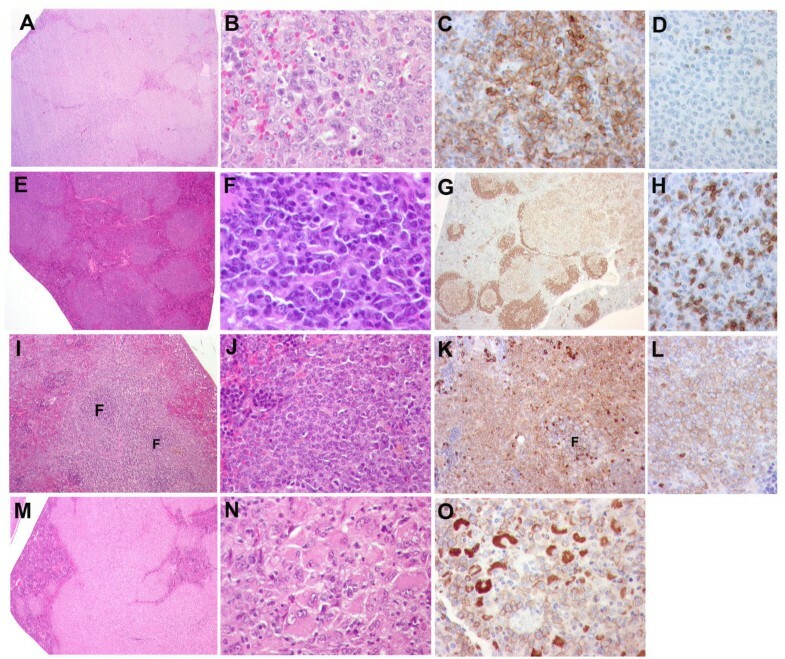 Most of the infected mice (about 90%) developed hematopoietic neoplasms within 250 days, and histological examination of the tumors showed that the introduced synonymous gag mutations have a significant influence on the phenotype of the induced tumors, changing the distribution of the different types as well as generating tumors of additional specificities such as de novo diffuse large B cell lymphoma (DLBCL) and histiocytic sarcoma. Interestingly, a broader spectrum of diagnoses was made from the two single splice-site mutants than from as well the wild-type as the double splice-site mutant. Both single- and double-spliced transcripts are produced in vivo using the SA' and/or the SD' sites, but the mechanisms underlying the observed effects on oncogenesis remain to be clarified. Likewise, analyses of provirus integration sites in tumor tissues, which identified 111 novel RISs (retroviral integration sites) and 35 novel CISs (common integration sites), did not clearly point to specific target genes or pathways to be associated with specific tumor diagnoses or individual viral mutants. We present here the first example of a doubly spliced transcript within the group of gammaretroviruses, and we show that mutation of the alternative splice sites that define this novel RNA product change the oncogenic potential of Akv murine leukemia virus. Many murine leukemia viruses (MLVs) belonging to the genus gammaretroviruses induce cancer when injected into susceptible newborn mice [1, 2]. These simple retroviruses do not themselves harbor transduced oncogenes, and their ability to cause cancer relies on the host cellular genes that are transcriptionally activated or otherwise mutated as a result of the integrated provirus [3–6]. Regarding the virus itself, it is well documented that the LTR region plays a crucial role for both the strength and cell type specificity of disease induction [7, 8]. Within the LTR the specificity has been located mainly to the enhancer region in U3, and further narrowed down to the sequences defining different transcription factor binding sites [9–12]. In spite of this predominant role of the LTR in MLV pathogenesis, also sequences outside this region have been shown to be important for the ability and potency of a particular virus to induce cancer. Infection is mediated by interaction between the viral envelope protein (Env) and a specific host cell receptor, and for the ecotropic MLVs such as Moloney, Akv, and SL3-3, this receptor has been identified as the mouse cationic amino acid transporter 1 (mCAT1) [13, 14]. A significant role of env in MLV pathogenesis is the involvement in the generation of recombinant polytropic viruses that takes place during T-cell lymphoma development. These MCF (mink cell focus-forming) viruses have the ability to superinfect cells, an aspect which is thought to contribute to tumor formation [15, 16]. In addition to the env gene, and perhaps somewhat surprisingly, the viral gag gene sequences have also proven to play a role in MLV pathogenesis. Thus, Audit et al. (1999)  showed that the introduction of only three synonymous nucleotide mutations in the capsid-coding gene of Moloney MLV (Mo-MLV) changed the oncogenic properties of this virus. The mutations were located at an alternative splice donor site (SD'), which together with the canonical env splice acceptor site was shown to produce a subgenomic transcript of 4.4 kb . The equivalent transcript, produced by Friend MLV, was subsequently shown to be packaged into virions, reversely transcribed and integrated in the host genome by normal viral mechanisms . While wild-type Mo-MLV induces T-cell lymphomas in 100% of the inoculated mice, the SD' mutant virus exhibited a much broader specificity, thus inducing – besides the expected T-cell tumors – erythroid or myelomonocytic leukemias. In contrast, the corresponding mutations in a Friend MLV background did not seem to influence the pathogenic potential of this virus at all. Both wild-type and mutant Friend MLVs induced exclusively the characteristic erythroleukemia . So it seems that the importance for the disease-inducing potential of the SD' site, although conserved among many species, is strongly dependent on the virus type. The SD' site has also been found to be used for production of the oncogenic gag-myb fusion RNAs in promonocytic leukemias induced by Mo-MLV in pristane-treated BALB/c mice . When the SD' site was mutated in this model, the overall disease incidence was not affected; however the proportion of myeloid leukemia decreased significantly, while the proportion of lymphoid leukemia increased. Moreover, no 5' insertional activation of c-myb (using alternative splice donor sites) could be found, thereby signifying a specific requirement of the SD' site for this mechanism . 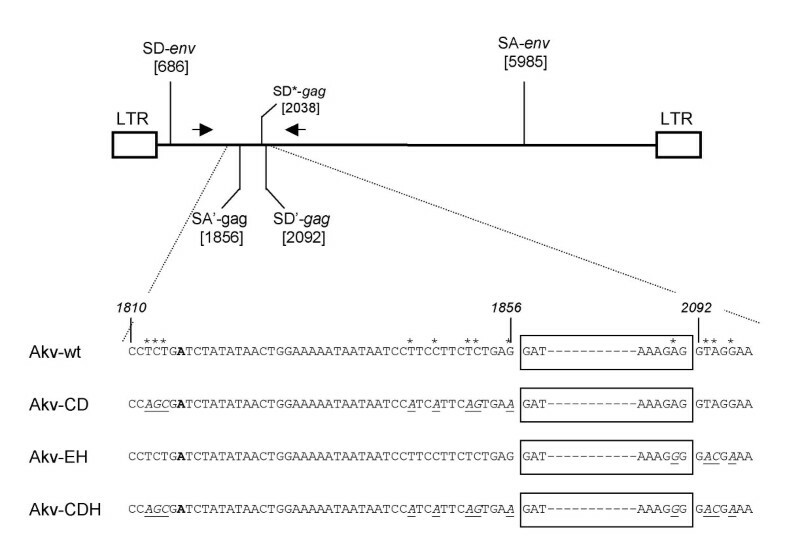 Here we report of the identification of an alternative splice acceptor site, SA', located in the capsid region of gag, which together with the gag splice donor site, SD' (corresponding to the one reported for Moloney and Friend MLV), or together with a second alternative gag splice donor site, SD*, defines a novel exon within the genus gammaretroviruses. We show that RNA splicing by use of the alternative splice sites does indeed take place in tumor tissue, and that both double- and single-spliced transcripts are produced. When mutating the SD', the SA', or both sites simultaneously, the splicing pattern is affected in a predictable way. Moreover, we demonstrate that the SA' and SD' mutations alter the oncogenic specificity of the Akv MLV, displayed by a change in the distribution of the diagnoses of the resulting tumors as well as by an induction of tumors of altered specificity such as histiocytic sarcoma and de novo diffuse large B cell lymphoma (DLBCL). In order to identify potential alternative splice donor and splice acceptor sites in Akv MLV, exon-trapping was performed using the exon-trapping vector pSPL3 (see Materials and Methods). In short, an exon resulting from usage of the alternative splice acceptor (SA') and either one of two alternative splice donor (SD' or SD*) sites located in the capsid region of gag (Fig. 1), was isolated and verified by RT-PCR analyses of RNA isolated from Akv MLV infected cells (data not shown). The size of the exon is 235 bp or 180 bp, depending on the splice donor site used. Location of the trapped exon. Upper panel shows the structure of proviral Akv MLV DNA with the positions of the splice sites indicated (SD; splice donor, SA; splice acceptor). Arrows signify the PCR primers used to verify the stability of the introduced mutations. Lower panel shows the positions and types of the introduced mutations, marked by asterisks and underlined. The SA'/SD'-delineated exon is indicated by the box. The boldfaced A in the sequence indicates the presumed branch point. To analyze a possible effect in vivo of the novel exon, defined by SA' and SD', three different alternative splice site mutant viruses, Akv-CD, Akv-EH, and Akv-CDH, mutated in either the SA' or SD' site, or in both sites simultaneously, were constructed and injected into newborn mice of the inbred NMRI strain. Fig. 1 shows the precise locations of the synonymous mutations around the trapped exon. Without altering the coding potential of the capsid gene, the mutations affect the branch point site, the pyrimidine region, the conserved splice junction AG and GT dinucleotides, and the fairly well-conserved exonal A at the SD' junction site. The positions of the three intron mutations at the SD' junction site are identical to those in Moloney and Friend MLV described by Audit et al. (1999) . As can be seen from Fig. 2 and Table 1 the majority of the infected mice (about 90%) developed tumors within 250 days with similar average latency periods of about 200 days for the four types of virus. Histological examination (examples shown in Fig. 3) and diagnosis according to the Bethesda classification  revealed that a large proportion (approx. 70%) of the total numbers of tumors could be classified as either follicular B-cell lymphoma (FBL) (13%), diffuse large B-cell lymphoma (DLBCL) progressed from FBL (33%), or plasmacytoma (PCT) (25%) (Table 2). However, the distribution was quite different within the different virus series; thus, almost one quarter of the Akv-wt induced tumors were diagnosed as FBL, while no tumor of the Akv-CD group (p < 0.05) or one tumor each of the Akv-EH or Akv-CDH groups fell into this group. In contrast, within the DLBCL tumors progressed from FBL the frequencies are similar (ranging from 24% to 39%) no matter if the causative virus contained mutated SA' and/or SD' sites or not. In the PCT group it appears that mutating the SA' site significantly impaired the ability of the virus to induce PCT (p < 0.05). On the other hand, this effect was not statistically significant if the SD' site was mutated, and curiously if both sites were mutated, wild-type level for PCT induction was restored. Abbreviations: FBL, follicular B cell lymphoma; DLBCL, diffuse large B cell lymphoma; PCT, plasmacytoma; SMZL, splenic marginal zone lymphoma; SBL, small B cell lymphoma; PTLL, precursor T cell lymphoblastic lymphoma; STL, small T-cell lymphoma. # De novo DLBCL refers to Bethesda classification "DLBCL centroblastic"; however, to stress the parallel to human de novo lymphomas we use this term. *In this group one of the 17 mice that developed tumors had two tumors, hence a total number of 18 tumors. Pathogenicity of Akv and derived splice site mutants in inbred NMRI mice. Shown are the cumulative incidences of tumor development related to age of injected mice (in days). Histopathology of tumors induced by Akv and derived splice site mutants. Representative examples are shown. (A to D) de novo diffuse large B-cell lymphoma. (A) Low magnification of a spleen infiltrated by a vaguely nodular lymphoid neoplasia (H&E staining). Magnification, ×25. (B) Higher magnification demonstrates that the neoplasia is composed of a monotonous population of large cells with blastic chromatin, one to three nucleoli and abundant eosinophilic cytoplasm characteristic of centroblasts (H&E staining). Magnification, ×640. (C) Anti-B220 highlights the large neoplastic cells, which are strongly positive (immunohistochemistry). Magnification, ×400. (D) Anti-CD3 shows that only few residual reactive T-cells are present (immunohistochemistry). Magnification, ×400. (E to H) Follicular lymphoma. (E) Low magnification of a spleen infiltrated by a clear nodular lymphoid proliferation (H&E staining). Magnification, ×25 (F) Higher magnification shows a combination of large centroblasts intermingled with small- to medium-sized lymphocytes or centrocytes (H&E staining). Magnification, ×640. (G) Anti-B220 highlights the expansion of the follicles, mainly of the germinal center lymphoid cells (light brown) (immunohistochemistry). Magnification, ×25. (H) Anti-CD3 reveals the presence of abundant reactive T-cells intermingled with the neoplastic B-cells (immunohistochemistry). Magnification, ×400. (I to L) Marginal zone cell lymphoma. (I) Low magnification of a spleen infiltrated by a marginal zone lymphoma. Note that the follicles (F) are small and the cells surrounding these follicles expand and infiltrate the red pulp in a marginal zone pattern (H&E staining). Magnification, ×100. (J) Higher magnification showing that the neoplasia is composed of a monotonous population of small- to medium-sized cells with open fine chromatin, inconspicuous nucleoli and abundant light eosinophilic cytoplasm (H&E staining). Magnification, ×400. (K) Anti-CD79a reveals that the tumor cells in the marginal zone area are strongly positive, whereas the cells in the germinal centers (F) are weakly positive. The opposite staining pattern is seen with anti-B220 (data not shown) (immunohistochemistry). Magnification, ×200. (L) Higher magnification with anti-CD79a shows a uniform membranous positivity of the tumor cells (immunohistochemistry). Magnification, ×400. (M to O) Histiocytic sarcoma. (M) Low magnification of a spleen diffusely infiltrated by a histiocytic sarcoma (H&E staining). Magnification, ×25. (N) Higher magnification shows the presence of large cells with abundant eosinophilic cytoplasm and bland nuclei characteristic of histiocytes (H&E staining). Magnification, ×400. (O) Anti-Mac 3 shows that all tumor cells are positive for this histiocytic marker, both in the cytoplasm and in the cell membrane (immunohistochemistry). Magnification, ×4 Histopathological and immunohistological analyses of tumor tissues. In line with this, the most dramatic effect in general was seen when only the SA' site was mutated as shown for Akv-CD; the tumor incidence of this mutant with respect to splenic marginal zone lymphoma (SMZL) increased from 8% to 28% (p < 0.1) and decreased to 0% as shown for Akv-EH (p < 0.05) and for Akv-CDH (p = 0.5). Moreover, the Akv-CD mutant virus was the only one that displayed a capability for inducing histiocytic sarcoma, a tumor type which has not been observed in any of our previous studies using NMRI mice (inbred or random-bred) infected with Akv, SL3-3, or different derived mutants of these. So in brief, synonymous mutations at the SA' site of Akv MLV markedly altered the oncogenic potential of the virus by significantly impairing the ability to induce both FBL and PCT. Besides, while the development of SMZL was increased by Akv-CD, it was abolished in Akv-EH and Akv-CDH, and most notably, a novel potential for inducing histiocytic sarcoma was established. The most pronounced effect of mutating the SD' site (Akv-EH) is the frequent occurrence (35%) of diffuse tumors, which according to the Bethesda classification represent DLBCL centroblastic (more than 50% of the infiltrating population is centroblasts). These tumors, where progression is not from either a follicular or a marginal lymphoma, are comparable to the de novo lymphomas in humans, and to emphasize this association we have used the term de novo DLBCL (Table 2). Strikingly, de novo DLBCLs were never observed among the wild-type induced tumors or among the other mutant induced tumors (p < 0.05). The finding of such tumors in mice is rare and could be exploited to understand the molecular changes in de novo DLBCL of mice, and eventually a useful mouse model of human de novo DLBCL might be generated from this set-up. Quite unexpectedly, the effect of mutating the SA' and SD' sites simultaneously (Akv-CDH) was the less manifested one. FBL incidence dropped from 23% to 7%; otherwise this mutant in our experimental setting displayed similar tumorigenic potential as the wild-type Akv MLV. To determine the stability of the introduced mutations, the regions containing the mutations were PCR amplified from genomic DNA prepared from the induced tumors, using the primers depicted in Fig. 1. The sequences of the amplified fragments confirmed in all cases the integrity of the introduced mutations (data not shown). The observed effect of the mutated splice sites on the oncogenic properties advocates that RNA splicing by means of the alternative SA' and SD' sites does indeed take place in vivo. To clarify and confirm the identity of the produced transcripts, the splice pattern in tumor tissues (and for comparison in NIH 3T3 cells infected with the same four viruses) was analyzed. RNA from the individual end-stage tumors (or from virally infected cells) was isolated, and conventional RT-PCRs were performed with primers designed in such a way that it should be possible to identify all four potential splice products using 4 different primer sets as shown in Fig. 4A. RT-PCR analyses of splice products generated in vivo. (A) The structures of the potential splice products A to D are illustrated at the top, with the positions and orientations of the PCR primers (see Materials and Methods) from the four primer sets depicted below. The predicted origins and sizes of the amplified fragments are given at the right. (B) Shown are examples from each series of amplified RT-PCR products visualized on ethidium bromide-stained agarose gels. The employed primer sets (#1 to #4) are listed above the lanes. Size markers are indicated at the left. With a few exceptions, all tumors were analyzed, and sequences of the amplified RT-PCR products determined to validate the specificity of the fragments (data not shown). Representative results from each virus series are shown in Fig. 4B. In all cases, PCR products representing splice product A (the regular env transcript; primer set #4) was observed, which implies that damage of the alternative splice sites, SA' and SD', does not impair the production of the regular single-spliced env RNA. Concerning splice product D (primer set #1) it was never amplified, neither from tumor tissues nor from cell culture studies, strongly indicating that this is not a bona fide transcript. The lack of detection of product D is unlikely to result from a technical PCR-problem since the two primers have been validated in other PCRs. For the Akv wild-type induced tumors, RT-PCR products representing the double-spliced product B (primer set #2), and fragments of expected size amplified by primer set #3, indicative of splice product B or C, were observed in all cases. As would be expected primer set #2, which is dependent on an intact SA' site, did not result in any amplification products using RNA from Akv-CD or Akv-CDH tumors. Surprisingly however, in five out of 14 analyzed Akv-EH tumor samples (represented by Akv-EH tumor no. 14 in Fig. 4B), a product slightly smaller than that of transcript version B was amplified. The subsequent sequence analyses revealed that the alternative splice donor site SD* (depicted in Fig. 1) in these cases consistently had been used, resulting in the generation of a splice product equivalent in structure to product B, however 54 nucleotides shorter. No correlation between tumor cell specificity and usage of the SD* site could be observed, since the five tumor samples originated from FBL, DLBCL progressed from FBL, de novo DLBCL, and the single case of STL (small T-cell lymphoma). The presence of the same splice product from the SD* site was verified by sequence analysis of RT-PCR products derived from tumors induced by the wild-type virus in some cases, although the product was consistently less prominent than product B.
Transcript C corresponds to the single-spliced transcript of 4.4 kb, which previously has been reported to be produced by both Friend and Moloney MLV using the SD' together with the canonical env SA' site [18, 19]. Our RT-PCR results confirm the existence of this single-spliced transcript, since products of the expected size were always amplified with primer set #3 using RNA from Akv-CD tumors (Fig. 4B), whereas product B (primer set #2) was never amplified in this material. In summary, by means of the alternative splice sites that define the novel gag exon, both a single-spliced transcript C as well as a novel double-spliced transcript B is produced in vivo, and when these alternative splice sites are destroyed, the splicing pattern is changed concordantly. The same RT-PCR analyses were performed for NIH 3T3 cells infected with the four viruses, which led to the same splice pattern (data not shown). In addition, Northern blot hybridizations with an ecotropic env-probe and with a probe covering the novel SA'-SD' defined exon in gag were performed with RNA isolated from these cells (Fig. 5). Besides the expected hybridization patterns of prominent bands of full-length (env and gag probe) and env mRNA (only env probe) sizes, a weaker band of a size corresponding to splice product C (4.4 kb) was detected with both probes. No distinct band corresponding to spliced RNA B was observed, suggesting a very low level of production and/or significant messenger instability. Northern blot hybridizations with an ecotropic specific env probe and a gag probe of RNA isolated from NIH 3T3 cells chronically infected with the viruses listed above each lane. The sizes of the full-length transcript (unspliced) and the single-spliced env transcript are indicated at the left. The arrow indicates splice product C. For verification of integrity and concentration of the loaded RNA, the original ethidium bromide stained agarose gel exposing 18S and 28S rRNAs is shown below. In order to identify a possible connection between specific retroviral integration sites (RIS) and specific diagnostic tumor types, provirus integration sites from the majority of the induced tumors were isolated and sequenced. We have then by subsequent homology searches of the mouse genome databases identified 240 unambiguous integration sites (Table 3). These integration site sequences represent tumors from 30 out of 40 (104 sequences), 14 out of 19 (46 sequences), 14 out of 18 (51 sequences), and 11 out of 16 (39 sequences) mice infected by Akv-wt, Akv-CD, Akv-EH, and Akv-CDH, respectively. This corresponds to an average of 3.6 integrations per analyzed tumor. Based on the searches in the UCSC database , and the Mouse Retrovirus Tagged Cancer Gene Database, RTCGD [24, 25], both version mm8, 111 novel RISs were identified. In an attempt to pick up candidate cancer genes that might be associated with specific tumor diagnoses, we looked for common integration sites (CISs), which would infer such genes [25, 26]. Hence, we compared the integration sites with each other as well as with previously defined RISs in RTCGD. In principle, using the recommendations from RTCGD with a window size of 100 kb, 50 kb, and 30 kb for CISs with 4 (or more), 3, or 2 insertions, respectively, we were hereby able to define 35 novel common integration sites (CISs) (Table 3). Just a single one of these could be correlated with a specific diagnosis and with a specific virus, since in two independently Akv-wt induced plasmacytomas a definite region of chromosome 15 was targeted. However, this region does not contain genes/RefSeqs within a 100 kb distance from the integrated proviruses, so for the present we cannot predict what – if any – candidate gene(s) that might have been influenced by the integrated proviruses. For the remaining 34 CISs more than one virus and more than one tumor diagnosis were implicated, which implies that no straightforward association between target gene (and/or causative virus) and tumor type can be deduced. aThe gene (or RefSeq) closest to the integrated provirus is given (UCSC, mouse mm8 assembly). --- indicates that the distance to the closest gene/RefSeq is more than 100 kb. bFor each insertion, it is indicated, based on RTCGD (mm8), whether a novel RIS has been defined. cFor each insertion, it is indicated, based on RTCGD (mm8), whether a novel CIS has been defined. The definition follows the recommendations from RTCGD with a window size of 100 kb, 50 kb, and 30 kb for CISs with 4 (or more), 3, or 2 insertions, respectively. * indicates an exception from this rule, if two integration sites are found within the same gene/RefSeq. In six cases, the same chromosomal locus was targeted several times. These cases include Bach2 (hit 4 times), Sox4 (hit 4 times), Hhex (hit 5 times), Ii (hit 5 times), a region of chr. 16 not containing any genes/RefSeqs within a distance of 100 kb from the integration sites (hit 5 times), and LOC433632 (hit 7 times). Five of these integration sites were already registered in RTCGD, only the Ii locus define a completely novel RIS/CIS. This latter finding may suggest that Ii targeting is strongly associated with the applied model system (virus/mouse strain). We also note that an integration has taken place within the first intron of Stk10 in a plasmacytoma induced by Akv-wt (Table 3, #140), which appears to be in conflict with the work of Shin et al., 2004  where Stk10 was described as a SMZL specific candidate gene. Finally, we examined if specific regions of the targeted gene/RefSeq have been favored with respect to orientation and position of the integrated provirus. We have recently reported of differences between Akv MLV and an enhancer mutant hereof, Akv1-99, in their patterns of proviral insertions around host transcription units in the induced tumors . In line with this, it might be envisioned that destroying the alternative splice sites of the virus could lead to a different pattern of integration site selection during tumorigenesis; e.g. it might be speculated if particular positions relative to the target gene somehow would facilitate gene deregulation dependent on the presence or absence of intact SA' and/or SD' sites. Accordingly, we allocated each individual integration site position and orientation to a defined region, i.e. either upstream, within the promoter, within 1. intron, within last intron, within all other introns, within exons, or downstream of the target gene (Table 4). Eleven cases in total were excluded as they were positioned – almost with the same distance – in between two target genes, upstream of one and downstream of the other. As seen in table 4, no clear differences with respect to the four viruses were observed, signifying that mutations of the alternative splice sites do not have major effect on the ability of the Akv MLV to affect the target gene/RefSeq from certain positions and/or orientations. It might be worth to notice that the overall picture shows that about half of all integrations are found within introns, and among these there appear to be a tendency for a provirus orientation opposite to that of the target gene. In these cases the formation of chimeric RNA species by promoter insertion and/or splicing would not be predicted. + or - denotes the orientation of the integrated provirus relative to the target gene/RefSeq. 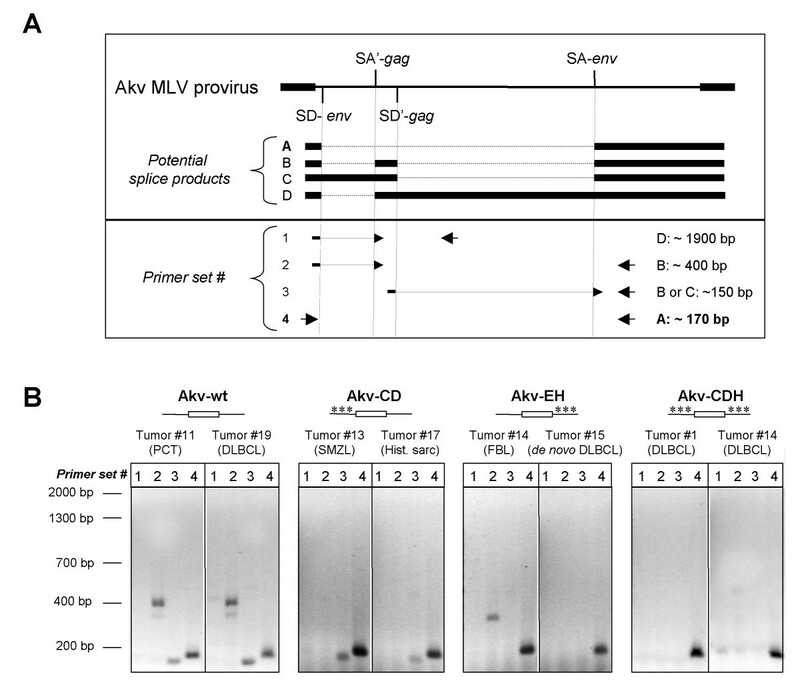 We have in the B-lymphomagenic Akv MLV identified a novel exon, which is defined by the alternative splice acceptor (SA') and the splice donor (SD') sites located in the capsid encoding region. While previous studies of Moloney and Friend MLV have demonstrated production of a 4.4 kb transcript using the same SD' site together with the canonical env SA site, this is the first report demonstrating the existence of an alternative SA' site and production of a double-spliced transcript during the life cycle of a replication-competent simple retrovirus. Yet it remains to be investigated how widespread this competence is. An alignment between six murine retroviruses shows that the conserved splice junction dinucleotide AG is present neither in Cas-Br-E nor in Moloney MLV, although the region in general is well-conserved (Fig. 6). DNA sequence alignment around the Akv MLV SA' site in the capsid-coding region of a series of different ecotropic MLVs. The 3' splice acceptor site consensus sequences are shown on top, with the border of the novel gag exon indicated by a vertical line. The boldfaced A in the sequence indicates the presumed branch point. We did not perform detailed analyses of the influence of the splice site mutations on the viral replication. However, since the same number (105 to 106) of infectious virus particles, as measured by infectious center assays, were injected from each virus series, and since the mutant viruses induced tumors with comparable incidences and latencies as the wild-type virus, it is not likely that the mutations had imposed severe weakening on the in vivo spreading capability. Hence the observed shifts in specificity of the induced tumors most likely are a direct result of the introduced mutations. However, we note that Houzet et al. observed a reduction in titer of SD'-mutants of Friend virus. A more complex picture was observed regarding the strong predisposition of Akv MLV for plasmacytoma induction. This predisposition was affected significantly only if the SA' alone was mutated. Thus, if the SD' site was mutated along with SA', wild-type potential was restored. This may indicate that the ability to induce plasmacytoma is dependent on a fine-tuned balance between the alternative single-spliced and double-spliced transcripts. If no double-spliced transcript is produced, while the single-spliced 4.4 kb transcript still is, as is the case for the SA' mutant, the single-spliced transcript somehow seems to be related with a barrier for plasmacytoma induction. On the other hand, if both transcripts are produced (Akv-wt) or none of them are produced (the SA'/SD' double mutant) the virus will hold a potential for inducing plasmacytomas. This is in line with the overall observation that the most pronounced effects were observed when the SA' or SD' splice sites were mutated individually, while the outcome of infection with the SA'/SD' double mutant in essence, except for the capability of FBL induction, was comparable to that of the wild-type virus. It may thus be speculated if a delicate balance between the alternatively single-spliced and double-spliced transcripts is a key determinant for the shift in oncogenic specificity, as demonstrated by the SA' and SD' splice site Akv mutants. The most striking shifts in specificity observed were the increased tendency to stimulate development of splenic marginal zone lymphoma and the exposure of a novel ability for inducing histiocytic sarcoma for the SA' site mutant. Although we have shown that mutation of the SA' site results in inhibition of generation of the double-spliced product, we are at this point not able to explain or point to any detailed mechanisms underlying the observed changes in specificity. The other remarkable shift in specificity was detected with the SD' mutant, which was the only virus capable of inducing centroblastic DLBCL, i.e. tumors for which an origin from the follicle or marginal zone could not be inferred and comparable to de novo DLBCL in humans. Moreover, since the exposed potential appeared quite strong (35% of the SD'-mutant induced tumors fell within this diagnosis), and since such tumors are in general rare in mice, this mutant virus may be a helpful starting point tool to create a solid mouse model of human de novo DLBCL. Obviously, the proposed significance of proper balances between the four different transcripts for the observed shifts in tumor specificity may reflect a need for a well-regulated balance between resulting translational products. We did not investigate if novel proteins were produced, but the open reading frames (ORFs) of both the alternatively singly and doubly spliced transcripts clearly reveal a potential for additional proteins to be produced. The gene products of the single-spliced 4.4 kb transcript most probably correspond to the p50 and p60 proteins made from the equivalent Friend MLV transcript . These proteins were produced with translation initiations at two initiation codons (AUG gag and CUGglyco-gag) in the same ORF and were shown to harbor the N-terminal Gag domain including matrix, p12, and the first 110 amino acids of the capsid in frame with the last 116 amino acids of integrase . Also the smaller double-spliced transcript harbors smaller ORFs providing a scene for even more MLV proteins. Intragenic elements such as gag enhancers have been known for many years in avian retroviruses [30, 31]. However, it seems unlikely that a similar element is involved here, since the mutant virus with SA' and SD' sites mutated together was clearly the less affected one. This observation, in concert with the observed consequence on generation of different splice products, more likely suggests that the effect on disease specificity is related to an RNA processing phenomenon rather than an intragenic gag determinant with an effect on transcription. Lymphoma-induction by non-acute murine retroviruses is associated with multiple proviral insertions that affect critical host genes. To achieve such multiple insertions the superinfection resistance caused by Env-expression must be by-passed. One possibility could be that reduced Env-expression caused by mutation of the gag splice sites as reported here might favor superinfection and thereby multiple proviral insertions. While we cannot exclude this possibility, our finding of the same number of sequence tags for proviral insertions for the wild-type and mutated viruses gives no immediately support to such a mechanism. Retroviral insertional mutagenesis has been established as a solid strategy for the identification of candidate cancer-causing genes [6, 26, 32–34]. Accordingly, in an effort to relate specific genes or pathways with specific diagnoses, splice pattern, or causative virus, we identified a pool of 240 integration sites from which 111 novel RISs and 35 novel CISs were defined. Our analyses did not immediately point to any clear correlations; nevertheless the collection of candidate genes may prove to be a central input in future attempts to understand the exact roles of the different splice transcripts and/or their resulting translational products in hematopoietic differentiation and tumorigenesis. We have in the B-lymphomagenic Akv MLV in the gag region identified a novel exon, which represents the first example of a doubly spliced gammaretroviral transcript. Mutations of the alternative splice sites that define this novel transcript change the distribution of the different induced tumor phenotypes as well as generate tumors of additional specificities such as de novo diffuse large B cell lymphoma and histiocytic sarcoma. Provirus integration site analyses revealing 111 novel RISs and 35 novel CISs did not clearly point to specific target genes or pathways to be associated with specific tumor diagnoses or individual viral mutants. However, the list of potential target genes will be useful for future studies of hematopoietic differentiation and tumorigenesis. Exon trapping was performed by using an Exon Trapping System kit (GibcoBRL) in essence according to supplied protocol. In brief, Akv DNA was digested with BamHI or BglII and all restriction fragments were subcloned into the pSPL3 plasmid, which in addition to sequences necessary for replication and growth in Escherichia coli contains SV40 sequences that provide for replication and transcription in COS-7 cells, splicing signals, and a multiple cloning site. Following transformation into E. coli, plasmid DNA was isolated and transfected into COS-7 cells. Total RNA was isolated from cultured cells and used for first-strand cDNA synthesis. The cDNA was PCR amplified in two rounds with primers located in the vector exons. The outcome of the PCR amplifications was several different fragments, which were all sequenced. Two of trapped sequences could be verified as exons by RT-PCR analyses of RNA isolated from Akv MLV infected cells. The two trapped exons were defined by the same splice acceptor site (SA', located in the gag region, Fig. 1), but by different splice donor sites (SD' and SD*, Fig. 1), and the sizes were 235 bp and 180 bp, respectively. The mutations of Akv MLV at splice acceptor (SA') and/or splice donor site (SD') sites were introduced by PCR-based oligonucleotide directed mutagenesis using the following primers harboring the wanted mutations (underlined): Mut-C: 5'-CTATATAACTGGAAAAATAATAATCCATCATTCAGTGAAGATCCAGGTAAACT-3', Mut-D: 5'-GGATTATTATTTTTCCAGTTATATAGATCGCTGGAGGAAAACG-3', and Mut-H: 5'-TTGGGATTACACCACCCAAAGGGGACGAAACCACCT-3'. A 720 bp Bsu36I – Bsu36I fragment harboring the mutations was cloned into the full length parental provirus. The correct sequence of the introduced Bsu 36I fragment was verified by sequence analysis. Akv wild-type virus λ623 and the three different alternative splice site mutant viruses, Akv-CD, Akv-EH, and Akv-CDH, mutated in either the SA' or SD' site, or in both sites simultaneously, were injected into newborn mice of the inbred NMRI strain, as described in details . Control mice of the same colony were mock injected with 0.1 mL complete medium. The animals were monitored 5 days per week. Mice were sacrificed and autopsied when showing signs of illness or tumor development. Tumor development was diagnosed on the basis of grossly enlarged lymphoid organs after having reached the size described earlier, which is compatible with lymphoma . Lymphoid tumor tissues and the liver were dissected, stored frozen (-80°C) and/or fixed in formalin for further analysis. Statistical analysis was carried out using the two-tailed Fisher's exact test. Formalin-fixed, paraffin-embedded sections from lymph nodes, thymus, spleen and liver were analyzed. Three-to-five micrometer-thick sections were cut and stained with hematoxylin and eosin (H&E), and when indicated with Giemsa, PAS or chloroacetate esterase. Tumors were classified according to the Bethesda proposals for classification of murine hematopoietic neoplasms [22, 37]. Immunohistochemistry was performed on an automated immunostainer (Ventana Medical System, Inc.; AZ, USA), according to the protocol provided by the company with minor modifications. After deparaffinization and rehydration, the slides were placed in a microwave pressure cooker in 0.01 M citrate buffer (pH 6.0), containing 0.1% Tween-20 and heated in a microwave oven at maximum power for 30 min. After cooling in Tris-buffered saline, the sections were incubated with 3% goat or rabbit serum for 20 min. The antibody panel used included CD3, CD79acy, TdT, myeloperoxidase (Dako, Hamburg, Germany), B220/CD45R and MAC3 (BD Pharmingen, NJ, USA). Appropriate positive controls were used to confirm the adequacy of the staining. Total cellular RNA was extracted from chronically infected NIH 3T3 cells by Trizol Reagent (Invitrogen), following the manufacturer's recommendations. Approximately 25 μg of RNA from each series (Akv-wt, Akv-CD, Akv-EH, Akv-CDH, and mock-infected cells) was size-fractionated on a 1.2% formaldehyde/agarose gel, and transferred to a nylon filter membrane (Zeta-Probe GT; Bio-Rad) under alkaline conditions (50 mM NaOH). Prehybridzation, hybridization, and washing procedures were according to standard protocol described in the instruction manual from Zeta-Probe GT [(pre)hybridization buffer: 0.25 M sodium phosphate, pH 7.2, 7% SDS, and washing buffers: 20 mM sodium phosphate, ph 7.2, 5% (1%) SDS). 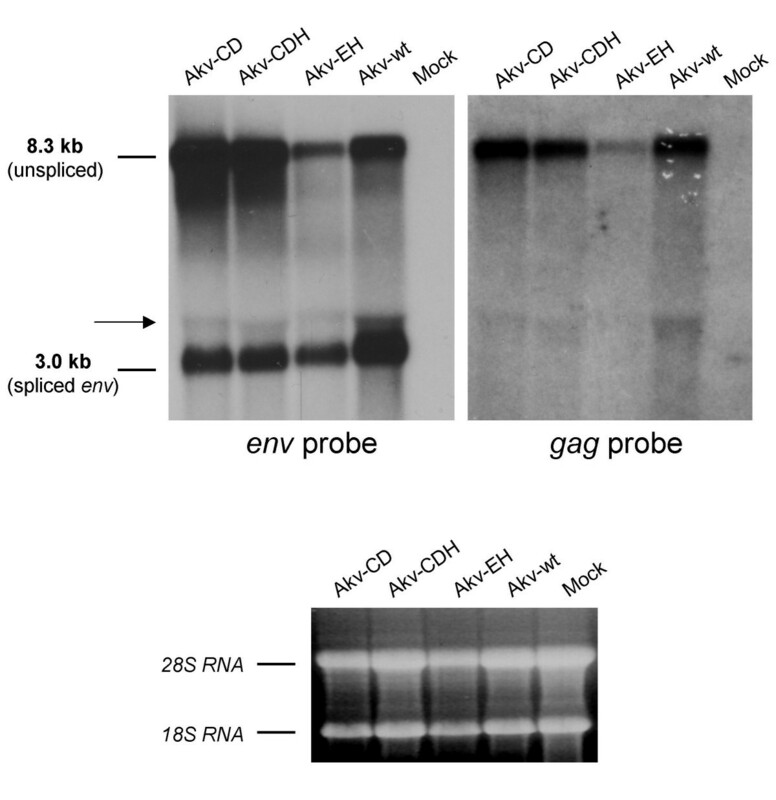 The hybridization probes were a 32P random priming labeled envelope specific probe (a 330 bp SmaI fragment of Akv MLV (positions 6240to 6570) ]) and a 32P random priming labeled gag specific probe covering the novel exon. The gag probe was a 380 bp PCR-fragment amplified by the following primers: gag-forward: 5'-ATGGTCAGTTGCAGTACTGGCCGT-3' and gag-reverse: 5'-TGGGGCTTCGGCCCGCGTTTTGGA-3'. The integrity and concentration of the RNA were confirmed by visual inspection of ethidium bromide-stained 18S and 28S rRNAs. Genomic DNA was purified from frozen tumor tissues by DNeasy Tissue Kit (Qiagen). Conservation of the introduced mutations was examined by PCR amplifying the region enclosing the mutations and by using the primers depicted in Fig. 1 (primer sequences and positions in Akv provirus: Forward primer, 5'-CCTATGAACCCCCTCCGTGGGTCA-3', nucleotides 1387–1410, and Reverse primer, 5'-TATTAAAGATCCTTTCGGCTTC-3', nucleotides 2412–2390). The resulting PCR products were analyzed by agarose gel electrophoresis, purified, and sequenced with nested sequencing primers (numberings refer to positions in Akv provirus). Forward primer, 5'-CGGGGAGGAGAAGCAGCGGGTGCT-3', nucleotides 1952–1976, and Reverse primer, 5'-GTCCCTAATAATTGCTGGCAAT-3', nucleotides 1942-1921. For the RT-PCR analyses, total cellular RNA was extracted from tumor tissues or chronically infected NIH 3T3 cells by Trizol Reagent (Invitrogen), following the manufacturer's recommendations. 1–5 μg total RNA was used to make first-strand cDNA by First-Strand cDNA Synthesis Kit (Amersham Biosciences) with an oligo-dT primer. This was followed by standard PCR amplification using four different primer sets, #1 to #4. Primer set #1: Forward primer, 5'-CCGACCCACCGTCGGGAGGAT-3', and reverse primer, 5'-CCTCATCAAACAGGGTGGGACT-3'. Primer set #2: Forward primer, 5'-CCGACCCACCGTCGGGAGGAT-3', and reverse primer, 5'-CACCCACACGGAGTCTCCAAT-3'. Primer set #3: Forward primer, 5'-GATTACACCACCCAAAGAGCTC-3', and reverse primer, 5'-CACCCACACGGAGTCTCCAAT-3'. Primer set #4 (env transcript): Forward primer, 5'-TTGGAGACCCCCGCCCAGGGACCACC-3', and reverse primer, 5'-CACCCACACGGAGTCTCCAAT-3'. The resulting RT-PCR products were analyzed by agarose gel electrophoresis, and in most cases purified and sequenced. Genomic DNA isolated from the induced tumors was analyzed for provirus integration sites by a splinkerette-based PCR method , described in details in . The resulting host/virus junction fragments were sequenced, and the cellular flanking sequences were compared (BLAT search) to the UCSC Genome Browser, version mm8, to determine the chromosomal position of the integrated provirus. To identify possible novel retrovirus integration sites (RISs) and common integration sites (CISs), the individual integration sites were concomitantly matched up to the Retroviral Tagged Cancer Gene Database (RTCGD), version mm8 [24, 25]. The definition of a CIS follows the recommendations from RTCGD with a window size of 100 kb, 50 kb, and 30 kb for CISs with 4 (or more), 3, or 2 insertions, respectively. Exception from the recommended window sizes was allowed in a few cases when two (or more) integrations were found within the same gene/RefSeq (Table 3). Amplified PCR products or purified plasmid preparations were sequenced with the DYEnamic ET terminator cycle sequencing kit (Amersham Pharmacia Biotech), following the manufacturer's recommendations, and reaction products were analyzed on an automated DNA sequencer (Applied Biosystems Inc.). We thank Astrid van der Aa Kühle, Angelika Appold, Katrin Reindl, Jaqueline Müller, Claudia Kloß, Nadine Kink, and Elenore Samson for excellent technical assistance. This work was supported by the Danish Cancer Society, the Novo Nordic Foundation, the Karen Elise Jensen Foundation, the Danish Natural Sciences and Medical Research Councils, NIH grant CA100266, Synergenics LLC, and the National Danish Research Foundation through the Centre for mRNP Biogenesis and Metabolism at the University of Aarhus. ABS and AHL carried out the molecular genetic studies (virus generation, exon trapping, PCR and RT-PCR analyses, northern analysis), and ABS drafted the manuscript. SK, LQM, and JS carried out pathogenicity experiments, and histopathological and immunohistochemical analyses. BW and MW carried out provirus tagging analyses. ABS, AHL, and FSP conceived of the study, and participated in its design and coordination. All authors read and approved the final manuscript.